Four hundred grams of grape leaves. Three cups of rice. Three glasses of water. Three cups minced meat. Two tablespoons of tomato paste. One bean is peeled and cut into small cubes. Two cups of chopped fresh parsley. One onion is chopped. Two tablespoons of pomegranate molasses. Tablespoon oil. Teaspoon salt. Half a teaspoon of meat condiment. Brush cutter. Half teaspoon black pepper. Crushed ground flour. Hill hammered. Crushed carnation. Crushed cinnamon sprinkle. Nutmeg Brush. Two teaspoons sugar. 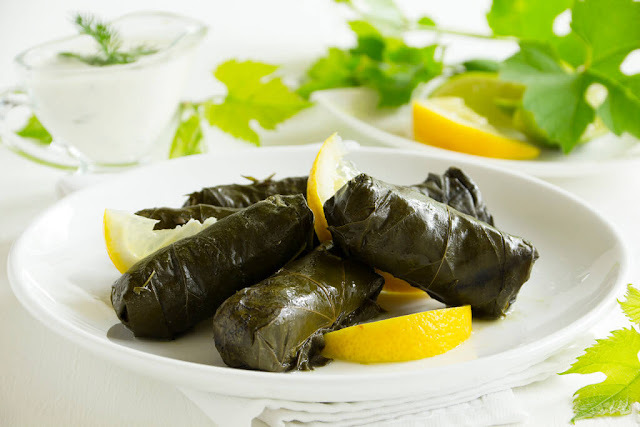 Pour the grape leaves in boiled water for about three minutes, then drain and drain. Mix the rice with onion, minced meat, tomatoes, tomato paste, parsley, spices mix and pomegranate paste. Stuff the grape leaves with rice filling from the coarse side. Place a tablespoon of filling in the paper and then bend the sides and damage themselves. Put the oil in a large saucepan. Pour the grape leaves stuffed in the pot over one another, and pour the water over it until all the contents are covered. Leave on medium heat to boil, then cover the saucepan, reduce the fire under it and leave to cook for about forty-five minutes. Quantities as desired by: white eggplant. Black abbrgin. Rumi pepper. Tomatoes. A sufficient amount of rice to fill. Onions. parsley. Mint. Salt and black pepper. Spices. Tomato oil. tomato sauce. Mix onions with spices, then add parsley, rice, tomatoes, sauces, oil and mint to the mixture. Peel the eggplant, clean the turkey pepper from the seeds, and sprinkle the tomatoes, and season the vegetables from the inside with salt and pepper and turn on her face for about half an hour. Wash eggplant, pepper and tomatoes and fill with filling mixture. Add the sauce remaining from the mixture until it reaches half of the pot, add the oil and raise the high fire to boil, and then the fire subsides to cook until it is cooked.